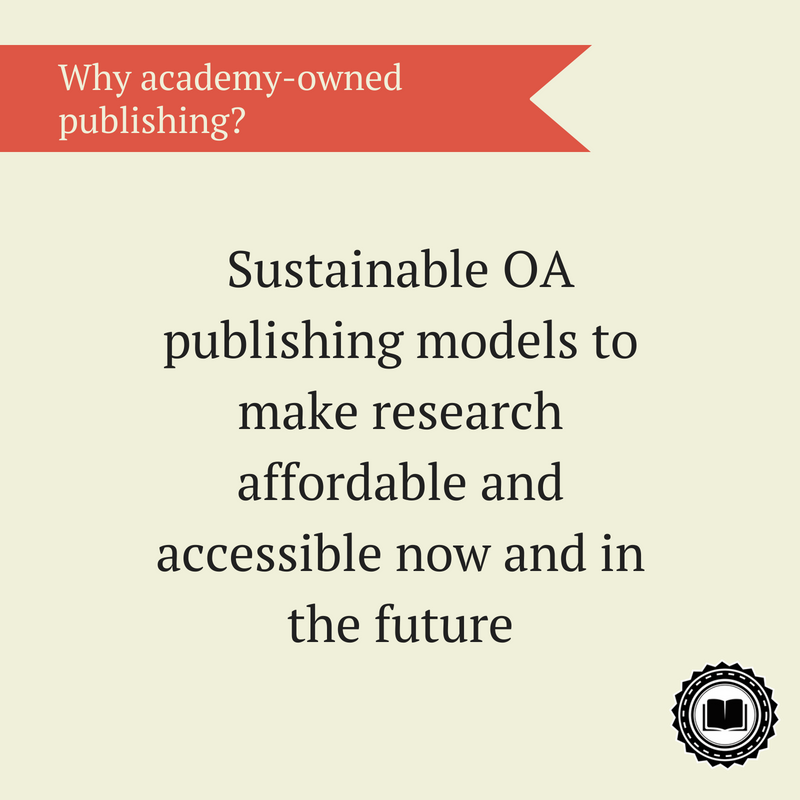 You’ve likely been following the academic-led publishing movement, aimed at developing more sustainable OA publishing models to make research affordable and accessible now and in the future. 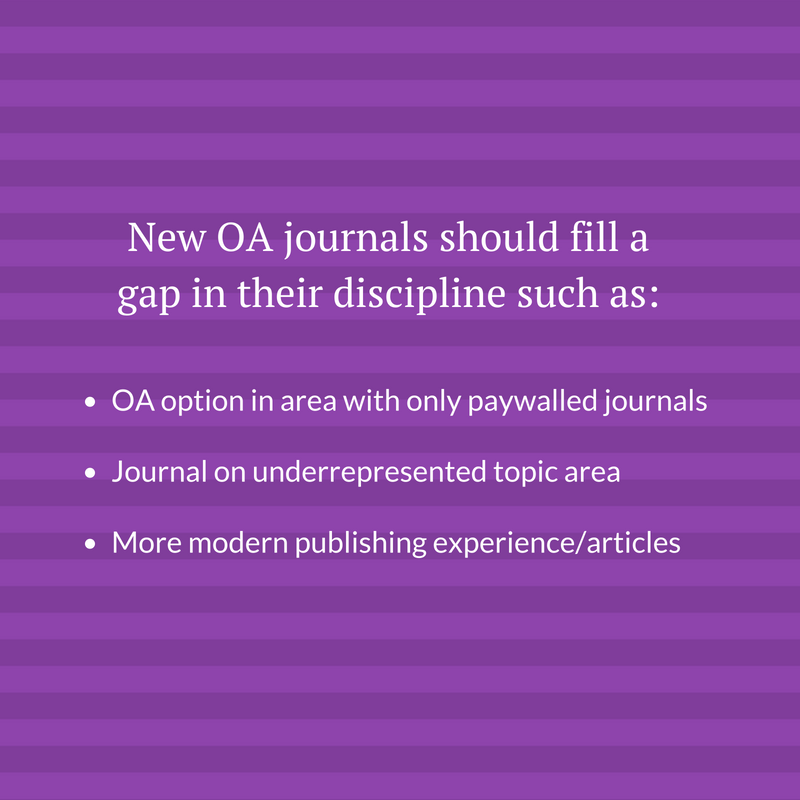 Academic-led journals like Discrete Analysis and Algebraic Combinatorics are showing that it’s possible to operate a high-quality OA journal at a fraction of the cost of both paywalled and, in many cases, corporate-run OA titles. Consider this: as noted by Scholastica Co-Founder Brian Cody—four articles at Elsevier’s self-reported average APC of $1,980 could easily be used to fund an entire academic-led OA journal for a year via a variety of tools and services. In addition to the many tools and services available for academic-led journal publishing, today, organizations like the Library Publishing Coalition and Free Journal Network are coming to the forefront of the scholarly publishing landscape to support academy-owned publishing. Now is a great time for scholars and institutions to run their own journals. 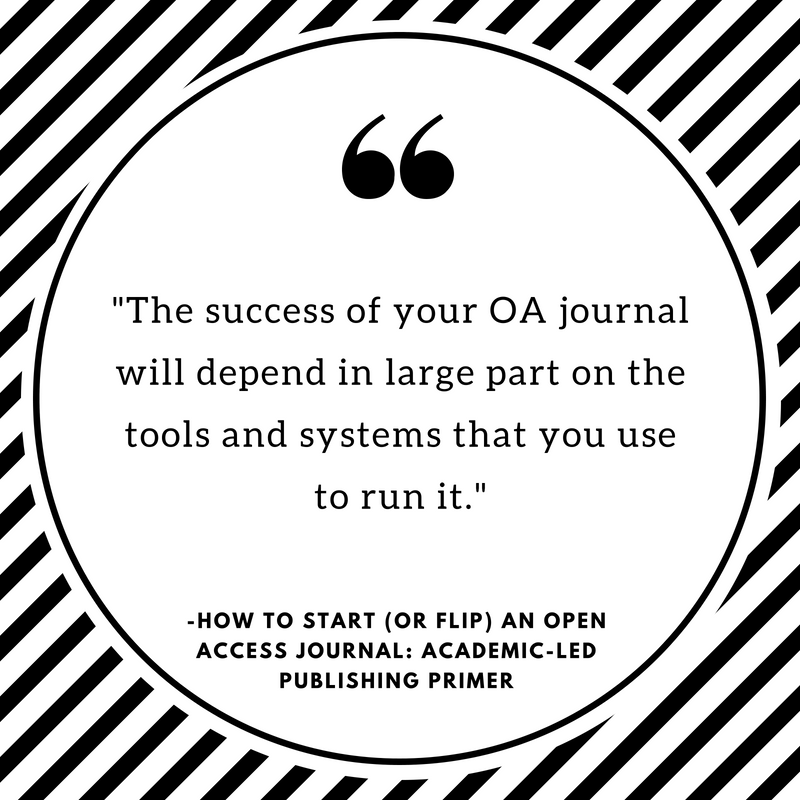 Quick note: This post is meant to be a primer for starting an OA journal. For more detailed overviews of the topics covered within it, be sure to check out our full resource library which includes guides to managing peer review, digital publishing, and more. There are two primary ways that scholars and institutions are facilitating academy-owned publishing: starting new OA journals and flipping existing journals to academic-led OA models. We’ll start out by discussing when to flip a journal. Of course, if you’re not working with a journal that could be flipped you can go ahead and skip this part. 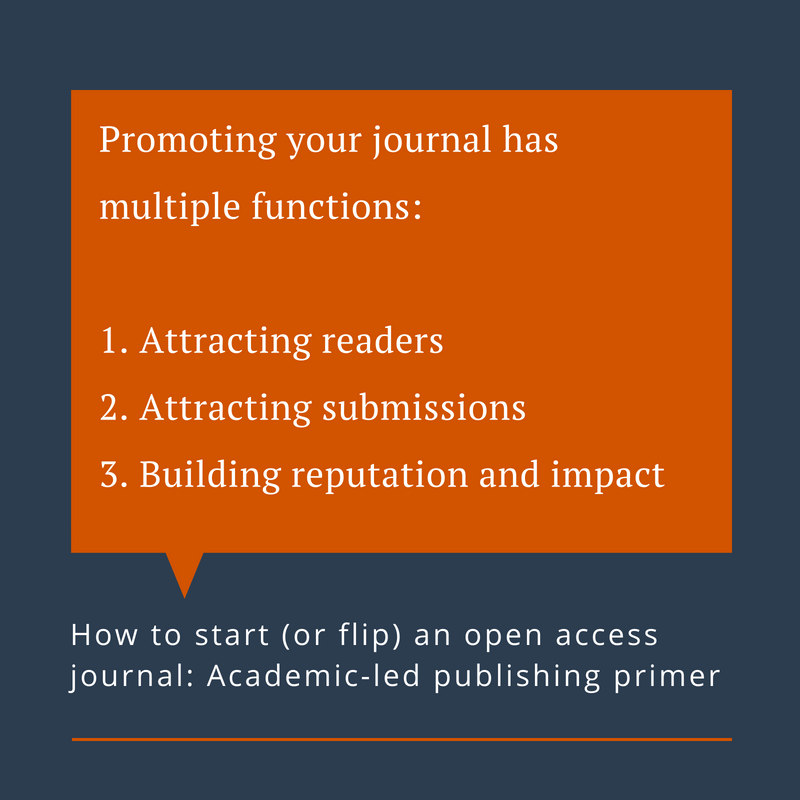 The term “journal flipping” refers to transitioning a paywalled journal to an OA publishing model. In recent years, there has been a rise in journal flipping as shown in the “Journal declarations of independence“ list on the Open Access Directory website. Your ability to flip a journal will depend on its current publishing situation. If you’re working with a publisher, you’ll have to present the idea to them. If the publisher is not interested in moving to an OA model, then you or the journal’s founding editor/institution may have the option of reclaiming ownership of the journal— but be sure to read the fine print of any publisher contracts! Many corporate-publisher contracts require journal founders to sign over the rights to the publication, essentially transferring full ownership and control of the title to the publisher. This was the case for Michael Rosenzweig the founder of Evolutionary Ecology, who learned he no longer had rights to the journal when he approached its publisher about lowering article costs. You can read his story here. If you find yourself in a situation like Evolutionary Ecology you do have another somewhat symbolic option to flip your journal. What the editors of that journal ended up doing is leaving the journal and starting an alternative title on the same topic, called Evolutionary Ecology Research. A more recent example of a mass exodus of journal editors to flip a title is the editors of Lingua leaving its publisher to start a new equivalent OA journal called Glossa. Such symbolic journal flipping, of course, requires coordination and a commitment among editors. If you are not in a position to flip an existing paywalled journal, you can always start a new journal. You obviously don’t want to just start a journal on a whim. Be sure to first determine where there is a clear publishing need in your discipline that you’ll fill either by: introducing an OA publishing alternative in a topic area(s) where there were previously only paywalled options; introducing a new journal on an underrepresented topic; introducing a journal that offers a better publishing experience than existing titles such as a more modern website, faster time to decision etc. ; or a combination of the three. Once you’ve determined a niche for your new journal to fill it’s time to finalize your editorial team. As founders of a new journal, you and your flagship co-editors will have to be prepared to handle ALL journal operation duties. You will be dealing with everything from submission and peer review management to financial planning and promotion for your publication. Make sure you are working with co-editors who have the time and ability to take on this commitment. With a team and a publication goal in place you can go ahead and start taking the first steps to set up your journal. We recommend creating an initial draft of your journal’s “aims and scope,” which you’ll want to include on the about page of your website to give readers and submitting authors a clear overview of what your publication is about. At the highest level, you should be able to condense your aims and scope into a single overview paragraph that includes: a statement that your journal is peer reviewed and an overview of the primary aim of your journal and the types of research you publish (journal field and relevant topics). In addition to outlining your aims and scope, now’s the time to pick a title for your journal and apply for unique identifiers that will be used by scholars and academic indexes to distinguish your journal. You’ll need to apply for an International Standard Serial Number or ISSN. An ISSN is a unique 8-digit code used to identify print and electronic media. Your ISSN will make it easier for scholars and librarians to find and index your journal, and it will also signal to readers and indexers that your journal is a serious publication. In addition to an ISSN, you’ll want to apply for a Digital Object Identifier (DOI). A DOI is a permanent unique object identifier for your journal that will make it easier for scholars and institutions to locate and cite your journal and the articles in it. While weblinks may change over time, your DOI will remain the same and carry all of your journal’s meta data. DOIs can be obtained through Crossref, the official DOI registration agency. When you join Crossref, you will be issued a DOI prefix. Once you have a prefix, you can assign DOIs to your journal issues and articles. Next—get ready to finalize your publishing model. 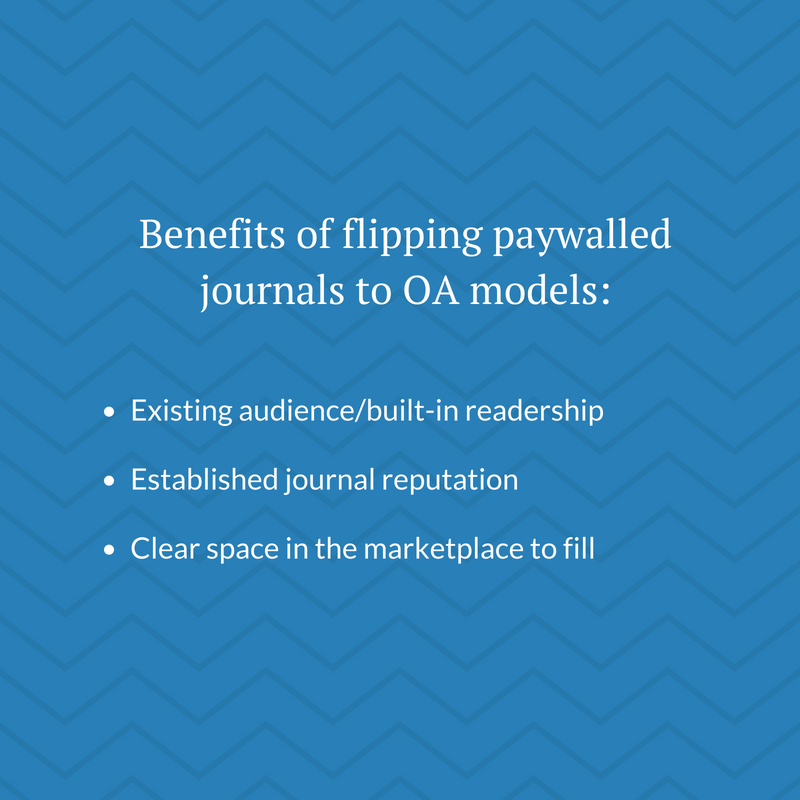 Whether you’re flipping an existing journal to OA or starting a new journal, you’ll have OA publishing logistics to consider such as what your OA publishing model will be and how you’ll fund your journal. Library publishing programs/partnerships: Libraries are emerging as leaders in the academy-owned journal publishing movement with in-depth knowledge of journal publishing and resources to run or support academic-led journals. The Library Publishing Coalition is an organization devoted to furthering library publishing initiatives. You can find great examples of current library publishing programs on their website, many of which are looking for new journals to work with. You may find that your library offers publishing services or you may be able to help them develop a publishing program. If you’re looking to launch a new journal, reaching out to your library is a great starting point. They can help you navigate potential funding options via the library or your institution at large. For example, the editors of the Wine Business Case Research Journal (WBCRJ)worked with their library to get funding for the journal, which is backed by the Wine Business Institute (WBI) at Sonoma State University, and to find tools and services to operate the journal. As in the case of WBCRJ, libraries don’t have to have a full-blown publishing program to support journals. Many are serving as journal sponsors and offering more administrative support, such as helping new OA journals find peer review and publishing tools and services and navigate technical aspects of journal management like indexing. Community-funded nonprofit publishers: Today, many non-profit organizations are also developing collective community funding models via grants, institutional subsidies, and article processing charges (APCs) to publish OA journals. This includes societies, associations, and university presses publishing OA journals, as well as the development of new nonprofit publishing initiatives such as the Open Library of the Humanities (OLH). OLH is a great example of how spreading out journal costs among various funding sources can keep many publications afloat. It operates via a library partnership model in which participating libraries contribute subsidies to the program. Additionally, OLH receives funding from the Andrew W. Mellon Foundation. Scholar-run community journals: As in the above community-funded model, you also have the option of creating your own community-funding approach to run one or more journals. Many are doing this via grants, funding from their institutions, APCs, or a combination of the three options. Examples of journals using this approach include Discrete Analysis, which is able to cover all of its operational costs via a small grant from University of Cambridge. And Sociological Science, which is entirely scholar-run and published under its own non-profit organization the Society for Sociological Science. Sociological Science is funded via a combination of a small submission fee and a publication fee that ranges from $10-$300 per article, well-below the article processing charges of its OA corporate-run counterparts. When it comes to journal funding, it’s important to keep in mind limitations that certain models can pose. For example, APCs can be difficult for disciplines that lack designated APC funding and they tend to create added administrative work for submitting authors. For these reasons, it’s a good idea to aim to get external journal funding. As shown in the examples above, it is possible to operate one or more journals via a combination of funding models to spread out costs. Who will vet incoming submissions? Who will be responsible for reaching out to reviewers and coordinating peer review? Who will oversee and make final publication decisions? Who will shepherd articles into production and publishing? When will editorial board meetings take place and what is the process for suggesting journal initiatives at meetings? You may want to consider how your journal can work with graduate students to spread out some of the more administrative work. Publication requirements: Map out all submission and formatting guidelines for your publication (consider which style guide you will use, and technical requirements for graphs, images, etc.). You will want to then translate this into a clear instructions for authors page. You can find more details on setting that up here. Peer review process: Here you’ll want to outline step by step how you will vet incoming submissions, the number of reviewers you will invite for each article, the number of rounds of review you will accept (it’s a good idea to limit this), what you will expect from reviewer feedback. It’s also a good idea to create a checklist and/or feedback template for reviewers to follow. Core journal policies: You’ll also need to map out core policies for your journal— mainly your copyright and ethical policies. Keep in mind that even OA journals need clear copyright policies. You can find information on setting up ethical guidelines here and a copyright policy here. The Fair Open Access Alliance recommends the industry standard CC-By license for OA journals. Publishing plan: Determine if you will publish articles on a rolling basis, in issues, or both. If you plan to make articles available in issues, determine how many you will publish each year and a cadence (e.g. twice a year). Once you know how you’ll publish articles you’ll need to start looking into website hosting and production options. Make sure that you’re thinking about the needs of modern scholars. You’ll want a professional website that is easy to navigate, has search engine optimized (SEO) website and article pages, and that ideally has an HTML reading option (which will help with SEO and make your articles mobile-friendly). There are many affordable journal publishing tools available that can help you set up a modern online journal website such as Scholastica’s open access publishing platform. The success of your OA journal will depend in large part on the tools and systems that you use to run it. You want to be sure that you have the proper tools and systems in place to manage peer review efficiently and to publish modern articles and issues. 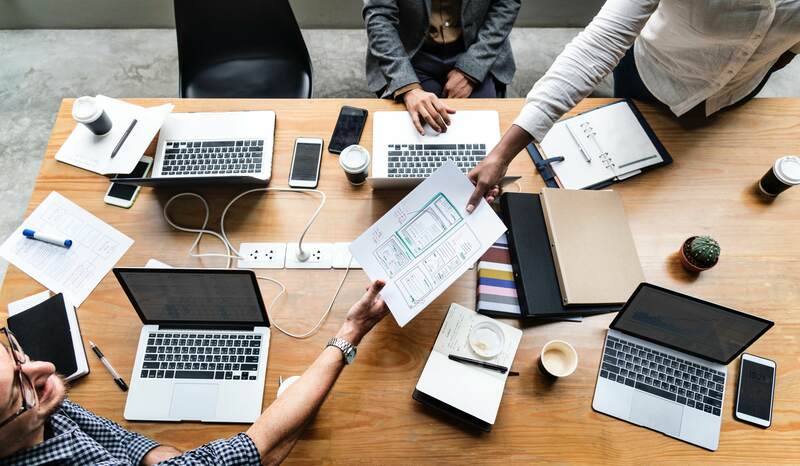 Technical barriers and available support: It’s best to avoid tools with high learning curves or that require advanced technical knowledge unless you have a large internal support system. For most journals/publishing programs, software that is easy to set up, has minimal upkeep, and that comes with technical support for editors (and ideally authors and reviewers) will be the best option. Level of manual work required: Manual tasks will make scaling your journal difficult and can increase room for error. As your publication grows, look for tools to automate peer review tracking and affordable services you can use to outsource labor-intensive aspects of journal publishing such as typesetting. The gap between peer review and publishing: It’s important to consider how well your journal is set up to move manuscripts from decision to publication. If the peer review and publishing software and services you’re using are completely separate you may be creating extra work for your team. Real and hidden costs: Consider not only the upfront costs of the tools you’re using but also the “hidden” costs of your organizations’ technical resources and time. Once you’ve considered your journal organization’s specific needs and resources you can start exploring peer review and publishing software. Even if you’re not ready for a system just yet, it’s a good idea to know what’s out there. For peer review software key features to look for include: easy manuscript tracking, automation for manual steps such as file versioning, ability to communicate with editors and authors and reviewers in one place, analytics for tracking editorial and reviewer performance so you can spot areas to improve. For publishing software key features include: Modern website design, ability to easily update your website and publish articles (ideally, you don’t want to have to wait on a web developer), search engine optimization, indexing support, publishing analytics. The Library Publishing Coalition has a great list of available peer review and publishing tools and services. Of course, you can’t have a peer reviewed journal without reviewers! You’ll want to have reviewers ready to work with before you start soliciting submissions so you’re not scrambling to find them as manuscripts are coming in. As you get reviewers on board, be sure to give them clear guidelines and show them appreciation for their efforts so they’ll want to keep working with your journal. As you start to attract a readership, you can share your article analytics to show that scholars are engaging with your journal content and encourage others to do the same. For more detailed guidance on journal promotion be sure to check out our Scholarly Journal Promotion 101 handbooks series. Ideally, you should be using tools and services that set you up for indexing success. For example, Scholastica offers automatic Google Scholar indexing, fields for DOIs and ORCIDs, and the option to typeset articles in full XML - the required format for many indexes. 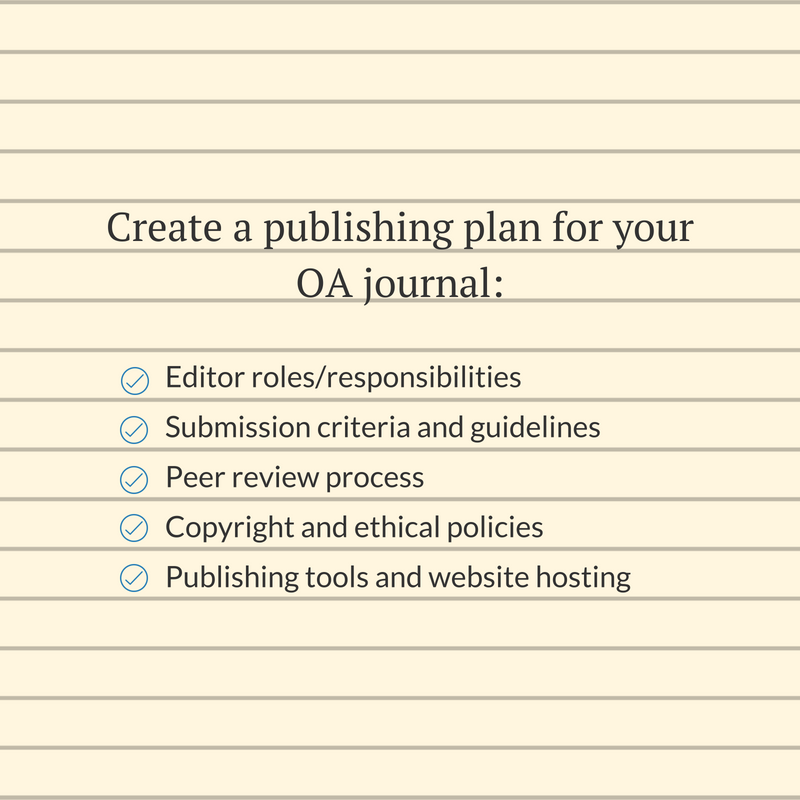 Ready to start your OA publishing initiative? 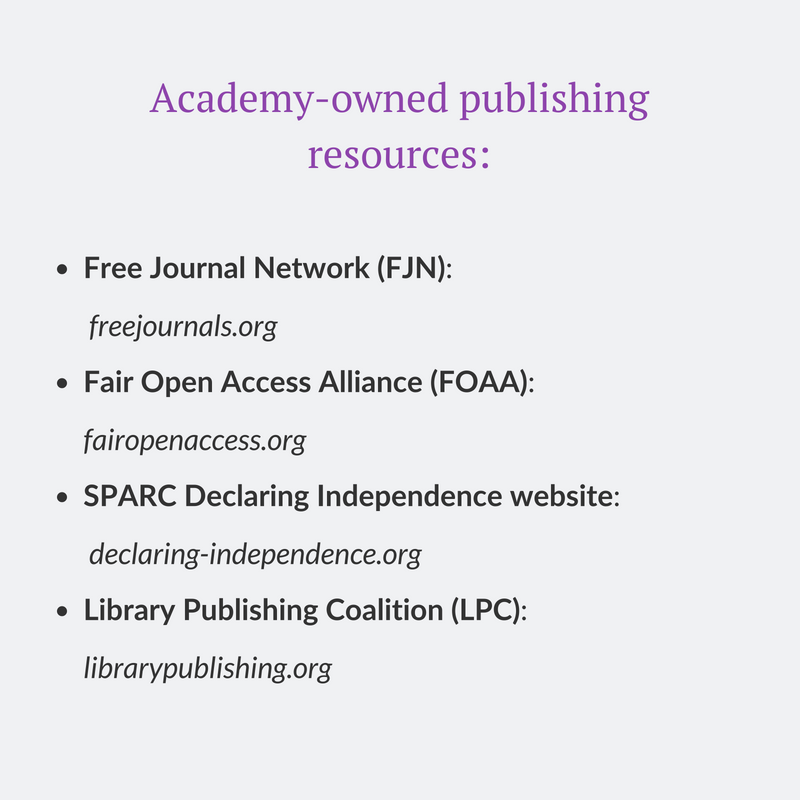 There are many free resources and groups that you can reach out to including the Free Journal Network (FJN), the Fair Open Access Alliance, the Library Publishing Coalition, and the SPARC Declaring Independence resource page. You can also check out our free resource page on academic-led journal publishing. If you want to learn more about how you can use Scholastica tools and services to publish an OA journal, you can schedule a demo here! The Journal of New Librarianship team knew they wanted to have a modern publication website, but they didn't have a lot of time to devote to building it. Scholastica Open Access Publishing allowed them to quickly launch a custom journal website without technical hassles. If you want your journal to reach the broadest possible readership, it's imperative for you to prioritize search engine optimization or SEO. In this post, we overview 4 often overlooked areas of SEO that all journals should focus on and why.